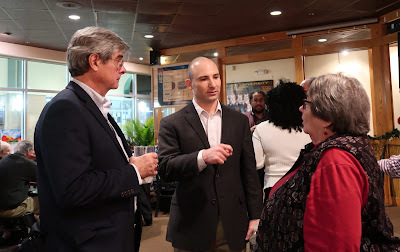 Steve Descano (center) meets voters at his campaign kickoff event at Brion's Grill in Fairfax. Raymond F. Morrogh, who was elected as Virginia commonwealth’s attorney for Fairfax County in 2007, will face a challenger in the Democratic primary on June 11, 2019. Steve Descano, a former federal prosecutor at the Justice Department, officially launched his campaign for the position Dec. 1. He is currently the chief operating officer and general counsel at Paragon Autism Services. The commonwealth’s attorney is responsible for prosecuting crime in Fairfax County courts, including the violation of state laws and county ordinances. Descano told the audience at his campaign kickoff event Dec. 1 that he wants to focus on three values – community, equality, and justice – and bring more transparency to the office of the commonwealth’s attorney. In his work as a member of the Fairfax County Civilian Police Review Panel, Descano found most people don’t know who the commonwealth’s attorney is or what that office is supposed to be doing. According to Descano, Morrogh favors retaining the cash bail system, and also favors mandatory minimum sentences for drug crimes, which Descano says are unfair. And while Descano applauds former Gov. Terry McAuliffe for putting in place a process to restore voting rights to certain convicted felons, he says Morrogh opposes the restoration of voting rights. So happy Mr. Descano is running against the corrupt Commonwealth Attorney Raymond Morrogh. First, Mr. Descano sounds like a worthy and qualified person to be the commonwealth attorney. Second, and most importantly, the current Commonwealth Attorney, Mr. Morrogh, is corrupt and has no ethics. All you need to do is google his name and you will see all the times he has not taken citizens' interests or rights into consideration and instead ruled for the police or for other corrupt county officials. He has been there since 1972 and probably has something on all the other government officials that uses to bully and get his way. He has thrown his own staff attorneys to the wolves in order to protect and save himself only. Please it's time for Fairfax County to make a change. I'm sure Morrogh will use all his dirty tricks to stay in power but he can't if we all vote him out! 1972? I THINK HE WAS 12 OR 13 THEN.